"We now have a really clear family tree of theses viruses in all those hosts – including birds, humans, horses, pigs – and once you have that, it changes the picture of how this virus evolved," said Michael Worobey, a professor of ecology and evolutionary biology at the University of Arizona, who co-led the study with Andrew Rambaut, a professor at the Institute of Evolutionary Biology at the University of Edinburgh. "The approach we developed works much better at resolving the true evolution and history than anything that has previously been used." Worobey explained that "if you don't account for the fact that the virus evolves at a different rates in each host species, you can get nonsense – nonsensical results about when and from where pandemic viruses emerged." "Once you resolve the evolutionary trees for these viruses correctly, everything snaps into place and makes much more sense," Worobey said, adding that the study originated at his kitchen table. "I had a bunch of those evolutionary trees printed out on paper in front of me and started measuring the lengths of the branches with my daughter's plastic ruler that happened to be on the table. Just like branches on a real tree, you can see that the branches on the evolutionary tree grow at different rates in humans versus horses versus birds. And I had a glimmer of an idea that this would be important for our public health inferences about where these viruses come from and how they evolve." "My longtime collaborator Andrew Rambaut implemented in the computer what I had been doing with a plastic ruler. We developed software that allows the clock to tick at different rates in different host species. Once we had that, it produces these very clear and clean results." 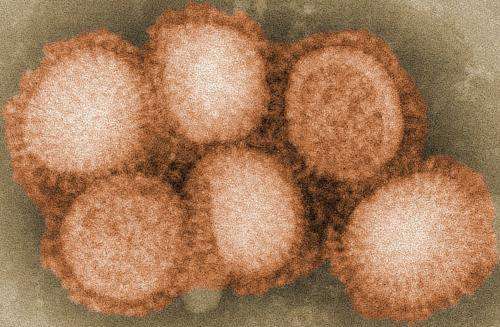 The team analyzed a dataset with more than 80,000 gene sequences representing the global diversity of the influenza A virus and analyzed them with their newly developed approach. The influenza A virus is subdivided into 17 so-called HA subtypes – H1 through H17 – and 10 subtypes of NA, N1-N10. These mix and match, for example H1N1, H7N9, with the greatest diversity seen in birds. "What we're finding is that the avian virus has an extremely shallow history in most genes, not much older than the invention of the telephone," Worobey explained. "In the 1870s, an immense horse flu outbreak swept across North America," Worobey said, "City by city and town by town, horses got sick and perhaps five percent of them died. Half of Boston burned down during the outbreak, because there were no horses to pull the pump wagons. Out here in the West, the U.S. Cavalry was fighting the Apaches on foot because all the horses were sick. This happened at a time when horsepower was actual horse power. The horse flu outbreak pulled the rug out from under the economy." "Interestingly, a previous research paper analyzing old newspaper records reported that in the days following the horse flu outbreak, there were repeated outbreaks described at the time as influenza killing chickens and other domestic birds," Worobey said. "That's another unexpected link in the history, and the there is a possibility that the two might be connected, given what we see in our trees." He added that the evolutionary results didn't allow for a definitive determination of whether the virus jumped from horses to birds or vice versa, but a close relationship between the two virus species is clearly there. "Our study changes that," Worobey said. "It is now clear that most of its genome jumped from birds very close to 1918 in the Western Hemisphere, and there is a suggestion that it was North America in particular." "People tend to think of wild birds as the source of everything, but we see a very strong indication of spillover from domestic birds to wild birds," he said. "It turns out the animals we keep for food and eggs may be substantially shaping the diversity of these viruses in the wild over time spans of decades. That is a surprise." None of the results are surprising. Interesting - yes but not surprising. I think it would be commonly thought that viral evolution of all viruses proceeds at different rates in different host species probably even in different individuals. It is just that there are not many viruses that can be traced across species and nobody has found a need or desire to measure the rate variation until this study. The wild to domestic connection would be the obvious connection suspected by most farmers. I.e. Domestic animals harbour and mutate disease (due to population proximity) which in turn infects wild birds which (being free) act as a vector to deliver the virus to other populations of domestic birds. The horse to bird infection is expected also in that one domestic species virus infects another domestic species and then we need vectors to deliver the virus to other populations of domestic animals in close proximity to one another to mutate viruses and so forth. When you say that nothing in this article is surprising, you are taking a purely biological approach: the claimed North American origin of the Spanish Influenza is *very* surprising, and if this is confirmed, it would result in having to re-write the history of the last months of the First World War. You see, up to now, it was assumed that the Spanish Influenza struck the Central Powers before it hit the Alliance, thus resulting in additional weakening of their forces leading to the failure of their 1918 Spring offensive. If the Spanish flu originated in North America and was brought to Europe by American forces, this changes the whole story of the last year of the war.